Most of these dolls have beautiful flower designs. These charming dolls are characterized by the bright colors and soft expression. 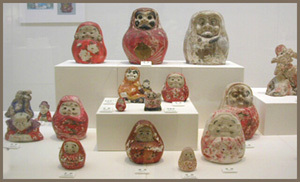 The art of these clay dolls began in the 18th century after studying Kyoto's Fushimi Dolls and Sendai's Tsutsumi Dolls. Each doll is adorned with a spring flower pattern of plum and peony blossoms. is a city located in Iwate Prefecture, Japan. As of 2005, the city has an estimated total population of 106,414. Hanamaki is most famous as the birthplace of Kenji Miyazawa and for its onsen. Kenji Miyazawa was born in Hanamaki in 1896, where he spent most of his life. Miyazawa’s invented Esperanto word Ihatov refers to Iwate prefecture in general, and is agreed to refer more specifically to Hanamaki itself. One of Hanamaki's most notable events is the Hanamaki Matsuri, an annual festival which takes place the second weekend of September and dates back to 1593. The three-day festivities include a dance of over one thousand synchronized traditional dancers; the carrying of over one hundred small shrines; and the parading of a dozen or so large, hand-constructed floats depicting historical, fictional, or mythical scenes and accompanied by drummers, flautists, and lantern-carriers. Of these dances, the most famous is Shishi Odori (dance of the deer). This dance involves men dressing as deer and banging drums. 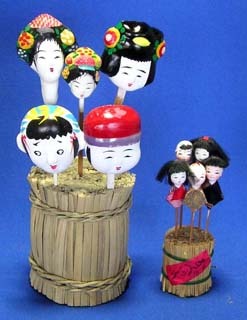 Hanamaki Dolls, along with Sendai’s Tsutsumi and Yonezawa’s Sagara, are counted as one of the three major doll-types of Tohoku. 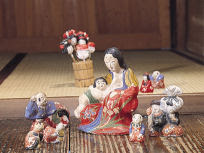 Although production ceased for a time because of a lack of craftsmen, a local toy producer and the city cooperated to revive the traditional doll-making techniques. 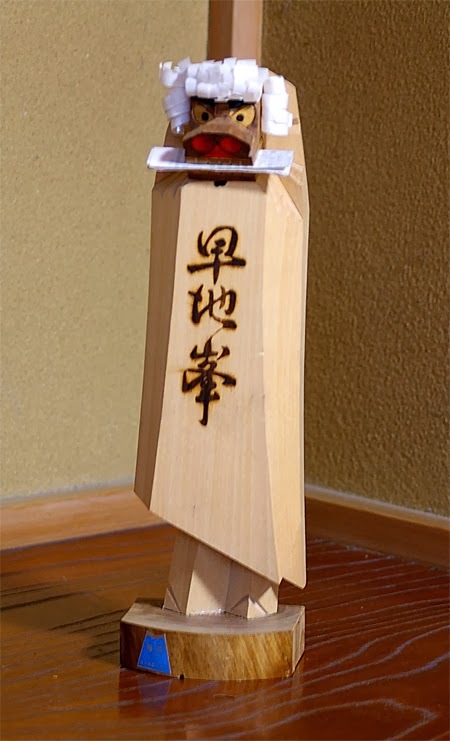 This statue, known as “Gongen San”, is displayed in homes in the hope that wishes will be granted. They are carved from Ohasama-grown wood using only one chisel. The chisel is called “Tsuki Nomi”.
. ushi 丑 ox, oxen (cow, bull, calf) . Children coul dress the dolls with paper or old pieces of cloth.
. Sumo wrestler Tanikaze Kajinosuke 谷風梶之助 from Mutsu 陸奥 .
. Matsuyo tora まつよ虎 Tiger from Matsuyo san .
. Shinobigoma 偲び駒 secret votive straw horse .
. oshirasama おしらさま人形 amulet for silk production .
. 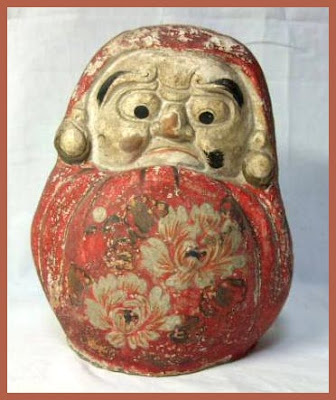 Folk Toys from Iwate .